My name is not "Bunny-chan". It's BARNABY. 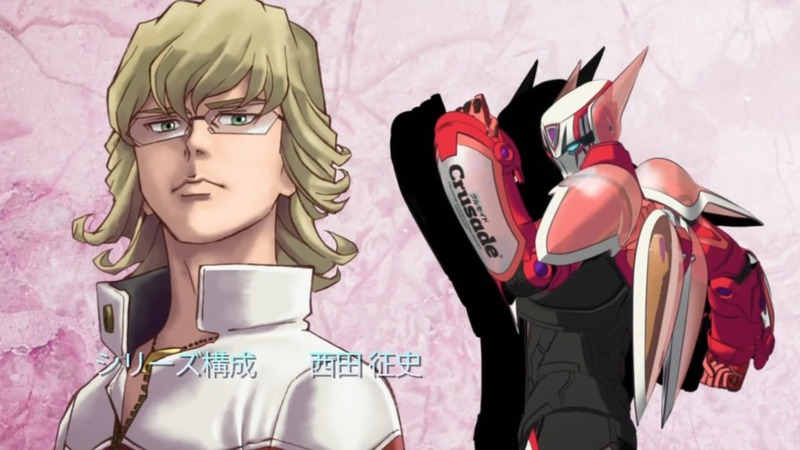 Long story short, Tiger & Bunny is an unlikely “bromance” anime viewed through the “Amerikomi” (American Comic Book) superhero genre. Superheroes capture crooks and save civilians live on HeroTV, all sponsored by major corporations. Yet a strong current of real heroism animates the show itself. Story & Premise: The core pairing is Kotetsu a.k.a. Wild Tiger, an idealistic “hero” with old-fashioned notions and a long, long list of fines for property destruction in the course of saving lives. In recent years his rankings have fallen, but he has to put up with sponsor requests because someone has to pay his fines and keep a roof over his head. This culminates in being paired with Barnaby Brooks Jr., who violates “hero” tradition by combating crime under his real name. The pair share a similar power – 5 minutes of greatly enhanced strength, speed, and endurance – and get along famously poorly. Barnaby is younger, smarter, and reeks of competence, whereas Wild Tiger is something of a goofball. Kotetsu receives a new armored suit to go along with Barnaby’s, complete with new corporate sponsor logos, and has to ride in a sidecar while Barnaby does the cool motorcycle driving. To top it off, Kotetsu plays off his partner’s name and the pointy ears of the suit (see picture at top) to dub him “Bunny,” which really, really annoys him. Plot W/O Spoilers: Trust between the two goes through several stages of rising and falling. Barnaby has a tragic past and a revenge-oriented mission; in another universe he might have put on a Bat cowl. Kotetsu has a young daughter who lives with her grandmother and a long list of broken promises due to his ever-busy life as a “hero”. Yet through the show’s camp, brilliant action scenes, and ratings-hungry HeroTV spectacles, it manages to not only hold interest, but be itself, build at its own pace, and create an ever growing mythos. The plot thickens as someone’s going around and killing bad guys instead of capturing them, very against the hero code, and the criminal organization involved in the deaths of Barnaby’s parents raises its ugly head. Any more would spoil, and you don’t want to be spoiled. The intended pace of exposure of information is important for full enjoyment. Production Values: The show’s production values are very high. Sound, color, sharpness, Japanese voice acting, and overall scripting and feel are all top notch. The show simply leaps out at you. You never feel like the studio is letting you down; you can enjoy the show on its own merits, ride its foibles and great hits, and appreciate it for not being a one-trick, one-tone pony. I really enjoyed watching this show. Trivia: One thing to point out: it’s not just about the superhero stuff. All the “heroes” above are NEXTs, essentially the Tiger & Bunny world’s version of comic book mutants. You know, like the X-Men. These powers are simply applied to heroism or, as the case may be, criminal endeavors. Some people are causing havoc because their powers have awakened and they don’t know how to control or use those powers productively; others are genuinely mean and nasty people. In the end, it’s the human factor that makes the difference, and that’s clearly the theme of this show. Rating: Let’s say 9.5/10 with excellent entertainment value, and the only reason I can’t give it a 10 is because some of the late show plot, I could see coming. And some I couldn’t, and I really enjoyed a few “Oh! So THAT’S IT! !” moments as things came to their big climax. Incidentally, what finally sold me on this show – and I was a late arrival to it – was that it makes comfortable viewing for young adults. It’s not a “kiddie” show at all. It’s mature in a good way, treats itself and its viewers with a lot of respect, and feels like a high quality effort. Bonus Points: You know, the corporate logos, especially prominent in the opening sequence, are at least partially from real companies, like Bandai, Softbank, etc., which are most definitely getting privileged advertising space in the process. This entry was posted in Anime, Art, Culture, Japan and tagged American, anime, Bunny, comics, culture, Japan, review, Sunrise, superhero, Tiger. Bookmark the permalink.